Photograph shows Main Street, west side from Bannatyne Avenue looking south. 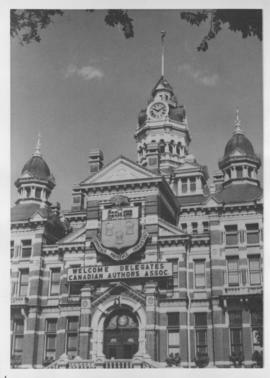 Part of City of Winnipeg Historical Photographs. Date of postcard is unknown, [before 1949]. Postcard shows Enderton Building, southwest Hargrave Street and Portage Avenue, in the aftermath of a fire. Photo likely taken by Lyall Commercial Photo Company, Ltd., Winnipeg. Photograph shows Central Business District: parking lot, west side Smith Street between Columbus Hall and St. Mary Avenue looking south from Graham Avenue to St. Mary Avenue (present Centennial Library site). Photograph shows Central Business District: 173-177 Smith Street.